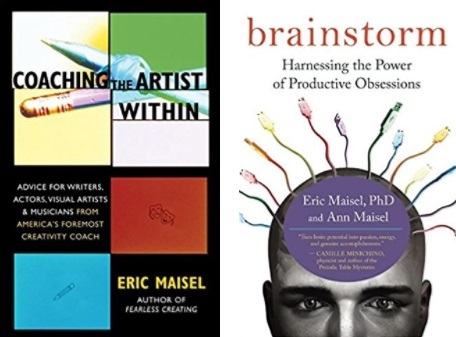 Dr. Eric Maisel is the author of more than 30 books, among them Mastering Creative Anxiety, The Van Gogh Blues, Fearless Creating, Coaching the Artist Within, Brainstorm, Sleep Thinking, The Atheist's Way and Creativity for Life. He is widely regarded as America's foremost creativity coach and trains coaches nationally and internationally. Eric Maisel writes for Professional Artist Magazine, Art Bistro, Whole Living, and the Huffington Post. He facilitates Deep Writing workshops in venues like San Francisco, New York, London, and Paris and trains creativity coaches and meaning coaches via online trainings. He maintains a phone-based coaching practice, allowing him to coach clients all over the world. Probably, write – anything. In my twenties, I lived by ghostwriting and I could write a book—a real, full-length book—on any subject in a month’s time (research included!). Unlike those writers who don’t enjoy writing, I love writing—I love imagining, I love collecting my thoughts, I love crafting beautiful sentences, I love providing a bit of wisdom in lovely paragraphs … and it’s what I do best. Taking responsibility for minimizing those grandiose, arrogant, and narcissist aspects of my personality that were indubitably front and center in my twenties and that I learned to notice, to reduce, or at least to contain. To do great work, to be world famous, to single-handedly defeat the drug-dominated mental health establishment, to have bestsellers in both fiction and nonfiction, to have a billion followers, and to accomplish all of that with eye-popping modesty, humor, and good will. Forty years of loyal marriage, solid children, a consistent daily practice of good work, and losing (and keeping off) twenty-five pounds. Physically, losing the ability to urinate because of an enlarged prostate, leading to catheters, surgery, and all of that. Decision-wise, finding myself flunked out of college at the height of the Vietnam War and needing to deal with that reality (outcome: I enlisted in the Army). I number writers in the existential tradition as my inspirations, among them Dostoevsky, Orwell, Kafka, Camus, Simenon, and Sartre. I’m passionate about the profound predicament that children find themselves in, too often receiving unwarranted mental disorder diagnoses followed by chemical fixes; I’m passionate about communicating my ideas about life purpose and meaning (i.e., ideas about what I see as welcome paradigm shifts from seeking meaning to making meaning and from “life purpose” to “life purposes”); I’m passionate about helping the victims of authoritarian wounding; oh, and lots more!